It was a rare Tuesday night with premiere of a new movie, in Indonesia. According to the synopsis from the cinema 21 website, it was categorized as action thriller movie which seemed interesting. I was a bit doubtful whether I could make it to the theater on time as I was having an outside office meeting at 3.30 PM and still needed some time to return back to office. After having to endure 45 minutes of jam in the taxi, I decided to walk back to office for around 10 minutes, as if I had continued with the taxi, it would probably have taken me another 30 minutes. I reached the cinema location at 10 minutes to 7PM and was able to see the 7.15PM show. It was also quite lucky that my wife could reach there on time by riding on an "ojek" after her food tasting event. Well let us move on to the story then, shall we? 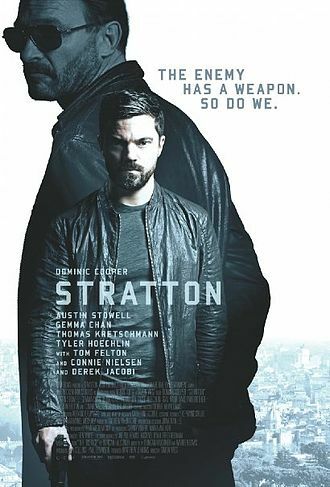 A British Special Boat Service unit led by John Stratton (Dominic Cooper - Warcraft: The Beginning, Captain America: The First Avenger etc) was deployed to a facility in Iran to do some mission to obtain a biological substance that could be made into weapon. To support their mission in the field, there were some tech team as well that consist of Aggy (Gemma Chan - Fantastic Beasts and Where to Find Them), Spinks (Jake Fairbrother) and Cummings (Tom Felton - Draco Malfoy in Harry Potter series). Stratton was accompanied by a US Navy Seal Sgt Marty (Tyler Hoechlin - Teen Wolf TV series and as Superman in Supergirl TV series). After completing the mission, all team went back to the base and continued with another mission. A new member was added into the team named Hank (Austin Stowell - Dolphin Tale 1 & 2). They have got instruction from their boss Sumner (Connie Nielsen - The Devil's Advocate, Gladiator, One Hour Photo etc) to capture a very dangerous terrorist leader, former Russian intelligent named Barovsky (Thomas Kretschmann - Captain America: The Winter Soldier, Hitman: Agent 47 etc). Stratton was shown to be living in a boat and had a very close friend named Ross (Derek Jacobi - The King's Speech, live version of Cinderella etc). He was like a father figure to him and provided some much needed comfort to Stratton during his difficult times, and also his childhood. Now I am not going into too much details of the plot further, but in short, the team had to go through various European countries to capture Barovsky and also to stop his plan of engaging bio attack that would kill tens of thousands people. Well, after finishing the movie, I could say that I was quite entertained at the beginning. The brief action sequence was actually quite suspenseful. As the movie continued though, the suspenseful part a bit decreasing. There were some twists that the director/writers tried to put into the story but unfortunately it was quite easy to guess. The movie category of action thriller was actually quite spot on. I think it is a right combination of both, though the action part was not spectacular as you would have expected in a movie with budget at the low end. The movie itself was quite short of having around 1.5 hour duration. It was a British movie and not having the credential of a Hollywood blockbuster movie with huge special effects or very good sound effects. In fact, the movie had a feel of being a pilot episode towards a TV series. Perhaps due to its rather simple plot and it felt like introduction to a new team of small "spy" unit which would go on to solve other cases involving espionage. Of all the characters in this movie, I loved Derek Jacobi's portrayal as Ross the most. He provided a much needed humor and he was truly believable as the father figure Stratton needed. The rest of the cast were just so so, I think. Though Barovski was quite convincing as a terrorist. Btw, the killings done in this movie was rather brutal, so I believe it's more suitable for adults. Stratton was based on novel written by Duncan Falconer about his experience during his services in the Special Boat Services of England. He created the character Stratton based on his own image. The novels were quite a success and spawned into few other novels. The British Special Boat Service (SBS) itself was an unknown unit to me (and probably most people in Asia?). It was a special forces unit in the naval service of United Kingdom which I think is similar to Navy Seals of US. This was referenced during conversation between Stratton and Marty in the beginning part. So if you are looking for a light simple action thriller movie with unspectacular action sequence, then you can give this one a try. But if you are looking for a very suspenseful high octane action thriller movie with larger budget, I would recommend you to look elsewhere. The choice is yours.